Slow Cooker Garlic Ranch Chicken is a toss it in the slow cooker and forget it for a few hours dish. Perfect for the days where you’re running from one activity or errand to another. No major chopping involved, and if you use the pre peeled garlic cloves no need for a knife at all. Place chicken breasts in the bottom of a 4 to 6 quart slow cooker. In a small bowl mix together the cream of chicken soup, garlic cloves, ranch dressing mix, and black pepper. Cover and cook on low for 5-6 hours or on high for 2-4 or until chicken is tender and has reached 165 degrees. Serve with mashed potatoes or egg noodles and butter garlic green beans or maybe some sauteed yellow squash. 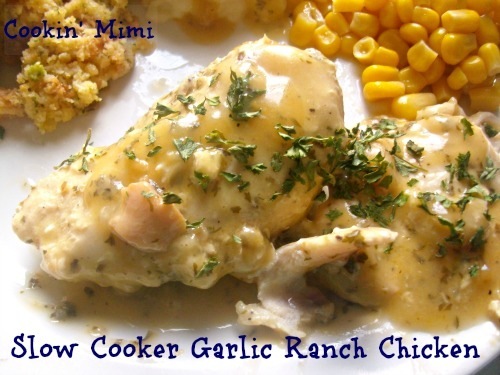 Follow Micha @ Cookin’ Mimi’s board Slow Cookin’ on Pinterest. I am looking properly through your blog for the first time, and it doesn’t help that I am hungry – everything looks SO good!! Off to go cook something now…! Looking forward to your Autumn recipes by the way! Thanks Ceri. I made the cake we discussed yesterday and oh my goodness it turned out fabulous. Micha this sounds awesome (like everything else on your blog, LOL)! I am so trying it, Sundays are ridiculously busy and this’ll be great for that. Another great Pin find! Can you make this with thighs as well? My husband is not much of a white meat lover! I don’t see why not. The cook times might be different so I would keep an eye on it the first time you made it. You are welcome. I first tried it a couple of years ago and haven’t looked back. It tastes so much better than the prepackaged mix and is ridiculously inexpensive. Yeah! I found a meal to try next week! I am pinning this straight away! I love seeing new ways to do a familiar dish. I came over from LadyBehindtheCurtain link up, I’m excited to see more of your creations. This looks delicious! Anything that I can put in a slow cooker and forget about it is ok with me. Thanks for sharing this recipe! Stopping by after seeing your yummy link at Lady Behind the Curtain’s Link Party. Thanks for the great slow cooker recipe. I just pinned it, I’ll be making this soon! Thank you! Do you add any water to the soup? Nope. There should be enough condensation from the steam while cooking for the right consistency. I am making this tonight.It looks so yummy ! I thought i would make some southern skillet corn to go with it. Thank you for this recipe. I’m excited to try it and have it in the crock pot right now. It looks really yummy and will sure to be a hit with my kids.